Send a PDF invoice attached to the order notification email that is sent to the customer. The app dynamically generates PDF invoices and attaches it to the email. It uses the Invoice Templates feature for the PDF layout and content. The app uses DOMPDF library. MBString extension: provides internationalization support. This extension is not enabled by default. Dompdf has limited internationalization support when this extension is not enabled. opcache (OPcache, XCache, APC, etc. ): improves performance. Download the DomPDF and install it using joomla installer. After installing DomPDF, download the PDF invoice app and install it using joomla installer. Click Enable in the PDF Invoices. Text entered here will be added as file name prefix. For example invoice. PDF invoice will be sent only if order status(All, Confirmed, Processed, New, Pending, Failed, Cancelled) matches the selected. Attached files here will be sent along with the PDF invoice.Note: You will have to upload additional files to media/j2store folder and then choose files here. Select to whom the PDF invoice should be sent. Set this to yes if you want to repair the strings via tidy. Set this to Yes to enable html5 parser. Enter the font family css. 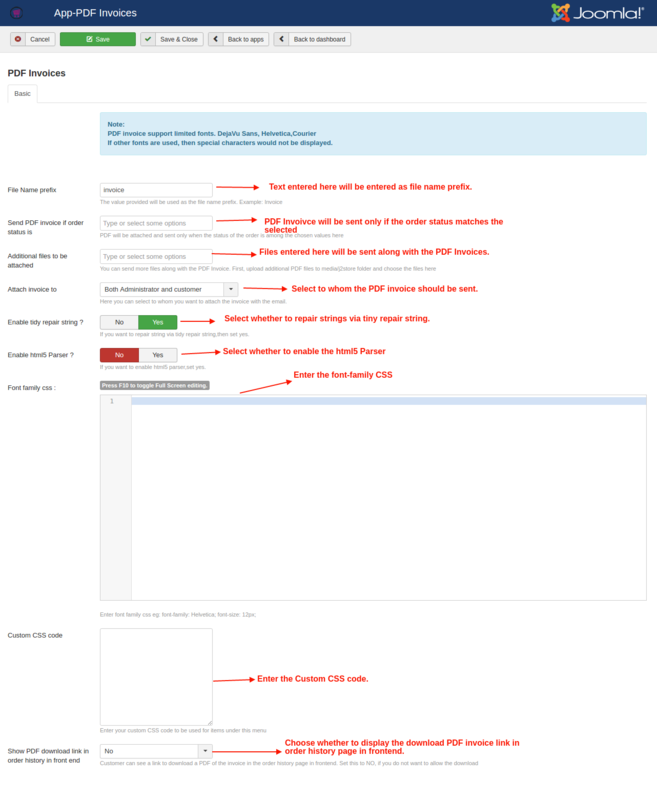 Set this YES will display the download PDF invoice link in order history page in frontend.